Bishop Michael J. Fitzgerald, center, accepts the offertory gifts during Mass Sunday, Sept. 15 at St. Aloysius Church, Pottstown. 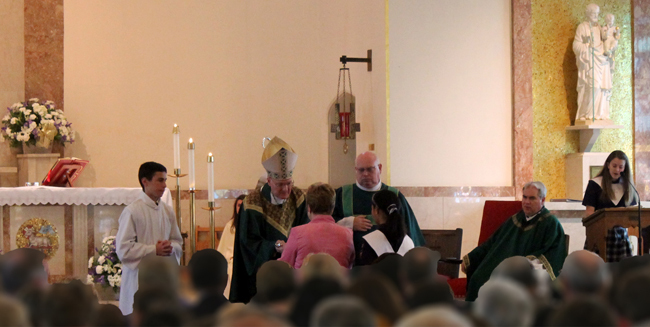 The Mass celebrated the 100th anniversary of the parish school. Also shown are Deacon George S. Harmansky (right of Bishop Fitzgerald) and Father Joseph L. Maloney, pastor of St. Aloysius, at far right. Father Stephen Paolino, in residence at the parish, also concelebrated the Mass. 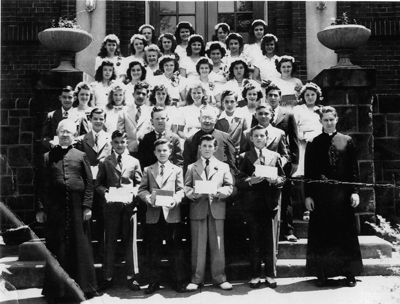 The eighth grade graduating class of St. Aloysius School stands at the front steps of the school joined by the parish’s priests in this 1946 photograph. When Father William Wachter opened a little parish school at St. Aloysius, Pottstown, in 1913, he couldn’t know that 100 years later it would still be thriving while so many other parish schools had dwindled to the point of extinction. For example, St. Aloysius in South Philadelphia, a German national parish where then-young Father Wachter was founding pastor in 1894 and where he immediately opened a school, has long ago passed out of existence. Bishop Michael J. Fitzgerald, who oversees Catholic education in the Archdiocese of Philadelphia, visited the Pottstown school on Sunday, Sept. 15, to celebrate a centennial Mass in the parish church for this singular milestone. When it opened St. Aloysius had 178 students and over the years there have been ups and downs. But this year, according to Sarah Kerins, the school’s principal, there are 250 children in pre-school, pre-k, kindergarten and grades one through eight. That first year saw six Sisters of St. Francis (now Sisters of St. Francis of Philadelphia) led by Sister Mary Digna as the first superior, arrive to take charge of the fledgling school. At that time the Sisters of St. Francis, like Father Wachter himself, were mostly German in heritage as were many of the Pottstown Catholics, which may be the reason he chose that particular congregation. Back then the tools of the trade were blackboards, chalk, catechisms and textbooks to teach mostly religion, reading, writing, arithmetic, history, geography and maybe a bit of art, music and poetry. In 1919, before a four-year high school program became the norm, a two-year commercial school was established to train students in office skills. In 1953 a four-year high school program was established at St. Aloysius. Two years later it became St. Pius X High School, which merged in 2010 into the new Pope John Paul II High School in Royersford. Times do change. Now in this 21st century, St. Aloysius has smart boards in every classroom, more than 30 iPads, a completely renovated computer lab and 33 desktop computers, according to Kerins. It’s not just technology that has changed. Back in 1912, the only Catholic schools that taught a foreign language on the elementary level were those attached to personal parishes – a German parish might teach German, or an Italian parish might include Italian lessons. Now St. Aloysius has introduced Spanish in grades four to eight, according to Kerins. Those six Sisters of St. Francis have been supplanted by a lay faculty of 18 augmented by a support staff of five. That single school building erected by Father Wachter has grown to four. Some things have not changed. For one thing, academic excellence is still stressed. “Last year we had three Neumann Scholars in our class of 26 graduates. So much about our school is fabulous,” Kerins said. In past generations kids in the lower grades would be honing their cursive writing skills by drills through the Palmer Method. Now we are in the computer age. Nick Boyce, who has been at St. Aloysius since kindergarten and is now in the eighth grade, remembers typing lessons in grade three. “We have computer lab, we play with smart boards, we do research. It’s fun and it helps me with my typing,” he said. As for the Spanish lessons, Nick believes it will really help when he gets to Pope John Paul II High School and have a language, probably French or Spanish, as a requirement. Kathleen Brady, the development director for St. Aloysius, is a 2002 grad. The school was a bit larger, probably around 500 students, she recalls, and although they had smart boards there were no iPads. The transition to lay faculty was almost complete – Sister Wanda Marie was principal and Sister Agnes taught computers, and that was the extent of the religious faculty. The teacher who probably influenced her the most was Donna Hennessey. “She was my literature teacher in seventh and eighth grade, and I think it was because of her I became an English major in college. She is still here; many of my teachers are still here,” Brady said. Many of the friends she made at St. Aloysius are still friends and probably will be for life. But really it isn’t the friendships and the excellent academic standards that make St Aloysius special. It’s that certain level of conduct and discipline that is part of a Catholic school education. “Our teachers are interested in building a good person, not just a good student,” Brady said.